I designed these boats to be the most lightweight and feminine Kayak & Canoe Earrings on the market. Each Sterling Silver boat is three-dimensional. The kayak has a tiny cockpit and little dragonflies on the bow, and waves on both sides of the boat. The Canoe has actual thwarts, and waves along both sides. I handmake the Ear Wires to clasp “behind” to prevent loss. The design includes a gemstone or crystal swirled into the Ear Wire. 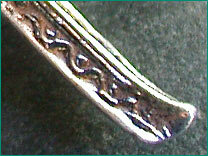 The matching Kayak or Canoe Necklace includes an 1- inch Sterling Silver Chain. The length of the chain can be shortened by clipping the clasp in any link. Click here to see what Kayak and Canoe inventory is currently available through my Etsy site. Highly customized canoe and kayak jewelry are also available to your preferences. Contact me with any creative ideas that you may have to make yours truly unique.